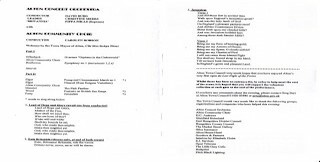 “I have found a copy of the programme from 2007. It was a printed on a page of double-sided A4 paper, far simpler than today’s full colour approx. 24 page version, but the format of the performance was much the same as this year’s concert. David Budd conducted and Christine Meers led the Alton Concert Orchestra; ‘Britannia’ was sung by Pippa Mills and Alton Community Choir was also invited to participate. The Town Mayor, Cllr. Mrs. Robyn Fitzer gave everyone a welcome, and the traditional ‘Last Night of the Proms’ pieces were played in the second half of the concert, just as they are now, with the audience words printed on the programme. In the first half of the concert, the orchestra performed Offenbach’s “Orpheus in the Underworld” Overture and three movements from Beethoven’s First Symphony. 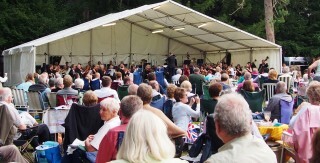 Orchestra would be interested in bringing an open-air classical music concert to Alton…. to which I said yes. I put the phone down and then thought “What have I done; how are we going to pull this one off”. We had never performed outdoors before, let alone in front of an audience which would number in the mid-hundreds, but we were resolved to take on the challenge despite the understandable nervousness surrounding the occasion. There were also many practical difficulties to overcome from the Town Council’s viewpoint, but by working closely together and trusting each other to deliver their own part of the bargain we built the solid foundation for the event you see and hear today. The need for a good sound system was spotted after that first concert, and Dave Tigg put in microphones and speakers in 2008 and he has enhanced the amplification system over the intervening years. Paul LeFeuvre then joined us to compere the event and audience numbers soon swelled into the thousands. 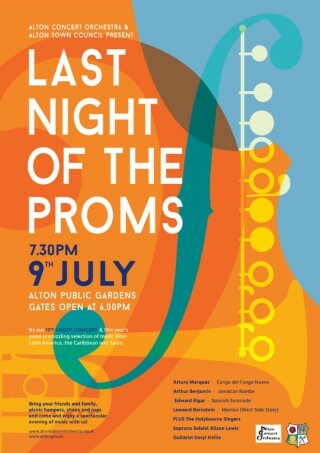 Last Night of the Proms, Alton’s prestigious annual open-air concert will take place in the Public Gardens on Saturday 8th July with gates opening at 6pm for 7.30pm start. 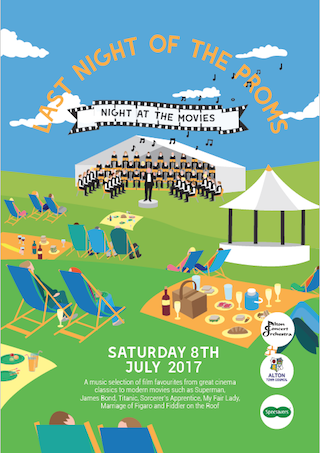 The theme for 2017 is ‘A Night at the Movies’ and will feature film theme tunes from modern-day movies such as James Bond, Superman Returns and Titanic, alongside cinema classics such as My Fair Lady and Fiddler on the Roof. The evening will conclude with traditional favourites Rule Britannia, the National Anthem and Auld Lang Syne to encourage the crowd to sing along and wave their flags. The Alton Concert Orchestra will be conducted by David Budd and assistant conductor Chris Gardner. The choir for 2017 will be the Alton Choral Society, conducted by Wendy Busby, performing Sunrise, Sunset from Fiddler on the Roof. This year we will be treated to not one but four soloist singers, with Jane Gray performing ‘I could have danced all night’ from My Fair Lady. Rebekah Abbott and Patricia Casement will be re-enacting the famous ‘Duettino Sull’aria’ duet, from act 3 of Wolfgang Amadeus Mozart's opera ‘The Marriage of Figaro.’ The now famous and much coveted role of the ‘Britannia’ soloist will be performed by Sam Kirk. 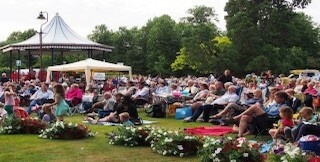 The event is organised by Alton Town Council in partnership with the Alton Concert Orchestra. We would like to thank our headline sponsor Specsavers Opticians Alton, for their generous donation towards staging this well-loved community event. We would also like to extend our sincere thanks to the other local businesses such as Travelbag, The Chocolate Frog Company and Alton College to name a few who have kindly become Proms Patrons for 2017. Without the generosity of our supporters and the visitors who make donations on evening we would not be able to continue to offer this wonderful concert year on year without an admission charge. Event programmes featuring biographies of lead performers will be available on the night together with Union Jack flags in exchange for a small donation on the night from the event information point located near the main entrance to the Public Gardens. This certainly is an evening not to be missed, so bring your family and friends, picnic blankets, hampers and deck chairs to enjoy a spectacular evening of open-air musical entertainment. This year's open-air classical concert has a fiery Latin American theme with popular pieces from Evita, Westside Story the Jamaican Rhumba, Mambo and Brindisi. The Alton Concert Orchestra will be joined by local choir Holybourne Singers for the Spanish Serenade, the choir will also be performing Brindisi. With the now traditional finale of British Classics such as Jerusalem and God Save the Queen to conclude the evening. 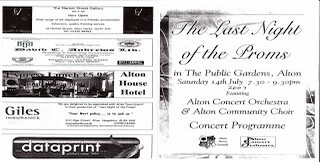 Alton's Last Night of the Proms does not charge admission to the event and relies on the generous Proms Patrons and business advertisers for their support and also to the visitors on the evening who contribute to the retiring collection.